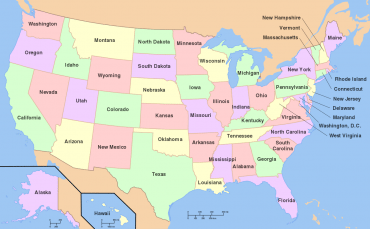 The US state map consists of all 50 states within the United States, along with state borders, major cities and capitals, and sometimes large bodies of water and rivers. The state map is a central part of the educational system, with most schools requiring students to learn the states, capitals and their locations. The United States is one of the largest countries in the world. All American kids must learn each of the 50 States that made up the nation. The best way to learn the names of all the 50 states is by looking at a map. In the interest of not only helping our readers to learn the names and locations of all fifty states but also for them to test their knowledge, we have assembled two different printable maps of the United States: one with the names of each and every state, and one without them. The continental United States is in North America. These territories are not featured in maps of the States, but we have added them here to provide clarification. So, whether you are researching for a paper or cramming for an exam, you have come to the right place! Here you will get access to full maps of the United States. Just read on! Before we go into the maps with and without the state names, let us provide you with some extra information that you might need if you are studying the States. In this section, we will go through all the 50 states once more. But this time, we will also include some relevant information: the state abbreviation, the name of the state capital, and the date when each state was admitted to the union. Capital city: Salt Lake City. – Follow this link to get your printable map of the U.S. with the State names. – Follow this link to get your printable map of the U.S. without the State names.